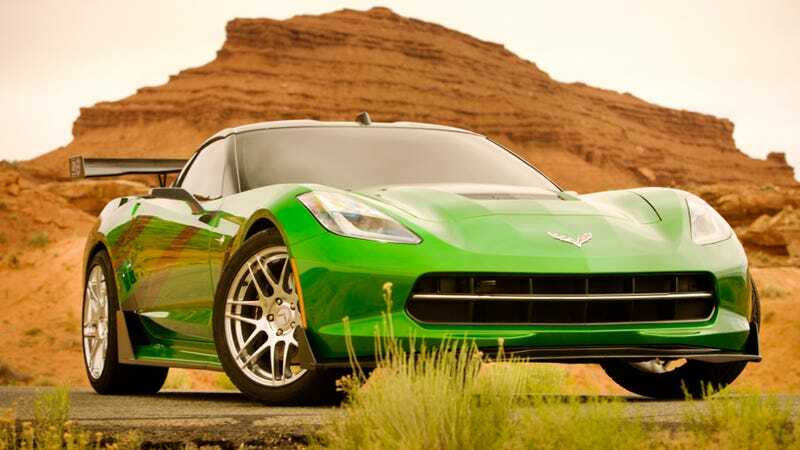 Never much for the concept of subtlety, director Michael Bay has cast two of the least subtle performance cars as Autobots in the next Transformers explosionfest: a 2014 Corvette Stingray and a Bugatti Veyron. Specifically, it's a Corvette Stingray in neon green paint with an aluminum spoiler (something I haven't had enough coffee to handle quite yet this morning) and a Bugatti Veyron Grand Sport Vitesse valued at $2.4 million, according to Yahoo! Movies UK. Was it wrong of me to hope they would go with a Jensen Interceptor like in Fast & Furious 6? I guess I was hoping that car was making a modern-day action movie comeback. Oh well. Also due to get a redesign for Transformers 4 is head 'bot honcho Optimus Prime, who looks quite a bit sleeker here than in previous film incarnations. Who's totally amped for Transformers 4? I'm sure it will be every bit as intellectually stimulating as the other three.